This badge was issued to GERARD LUECHINGER on 29 Mar 2018. 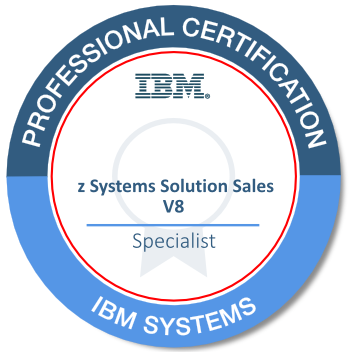 The IBM Certified Specialist – z Systems Solutions Sales V8 creates, identifies, and expands opportunities and takes customer orders to fulfillment. A successful z Systems sales specialist possesses the skills and knowledge to effectively demonstrate the following capabilities: Determine a customer’s business needs and requirements, design and sell z Systems solutions that address those needs and requirements, and position each solution in terms of what it will do for the customer’s business.